Pride is a band that I discovered by chance in 2001. An online music store that I frequent had 2001's Far From The Edge discounted, so I blindly bought the album based on the Def Leppard comparison listed on this website. This turned out to be a pleasant surprise for me. Although much of the debut was a bit too mellow for my tastes, I could certainly tell that Pride had what it takes to put together a fine career. The guys have returned with their sophomore album, Signs of Purity. Much to my pleasure, Pride have taken a taken a heavier approach to this album. While the band's sound still retains an AOR flavor, it is more accurate to classify this album as hard rock. The guitar work has a much more aggressive tone and harder edge than the light and "airy" feeling of Far From The Edge. 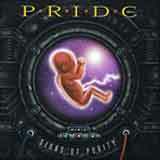 Pride still uses keyboards at a modest level, but the guitars are at the forefront of the sound this time around. If you can imagine a vocalist that is 75% Joe Elliot and 25% Ted Poley, then you will have a pretty good idea of what you will hear with this band. This man has the highly emotional, slightly raspy qualities of Joe Elliot mixed with the charm of Ted Poley. Soaring melodies are not in shortage on Signs of Purity. This is the type of album that finds its way into your long-term memory upon first listen thanks to the sheer catchiness of these songs. Again, keyboards are used just enough to emphasize the melodies, not overused in the least. The guitar work is simply excellent, with memorable rhythms and dual guitar solos constantly bubbling to the surface. This is the type of album that makes me totally forget about that pile of crap album (X) that Def Leppard dropped on us a couple years ago. Each and every song on this album is memorable, leaving the listener satisfied from start to finish. The guys have paid close attention to songwriting details with this album. Not only are the melodies extremely addictive, but each guitar solo and keyboard line gels together seamlessly. The harmony vocals and thick and rich, but not over the top. Before you know it, the album is over and you are hoping that the guys can come up with another album in less than 2.5 years time. Pride have a certain chemistry that gives their music extra impact. The guys are fans of this genre and absolutely enjoy making quality music of their own. This is evidenced with the passing of each song on the album. Signs of Purity is the type of album that I could never play as background music. Each rhythm, bombastic melody, and spirited guitar solo refuses to let me sit idle without devoting my full listening attention. Signs of Purity provides a steady dose of hard rock throughout the album. The only exception is the sole ballad of the album, Heaven's Waiting, which closes out the album. If you like addicitive, high quality hard rock, you've got to check out this album. Each song with gnaw at you long after the album is finished and I have faith that this album will remain in your stereo for quite some time. Disgruntled fans of Def Leppard, fans of Harem Scarem, Talisman, and melodic hard rock in general will find a lot to like with Signs of Purity.